It doesn't on the face of it seem a fun way to spend a Friday evening in February - watching a woman losing her mind. But then this is Ayckbourn, the man who manages to inject humour into the most mortifying of situations. 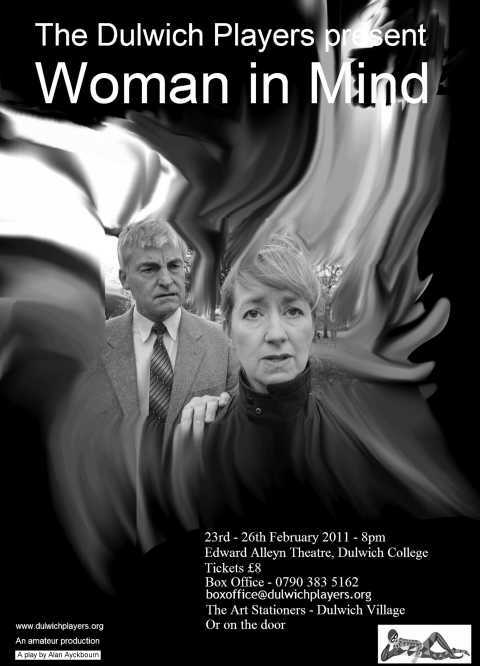 Woman in Mind is described as a dark comedy, and it is darker than most. Indeed, some people found it rather uncomfortable to be laughing at the farcical situations that arise as Susan's grasp on reality loosens. 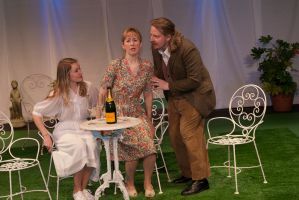 At the start of the play she has bumped her head and seems to be hallucinating; her mind has created a perfect family, an exact counterpoint to her "real" family, providing the love and attention that is so sorely lacking in her now empty, loveless marriage. 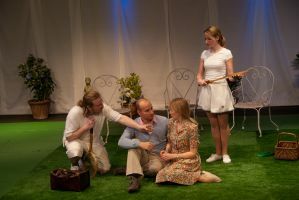 It is ambitious of Ayckbourn to try and portray this on stage, as the switch between fantasy and reality can be done much more effectively on film, with its limitless special effects. 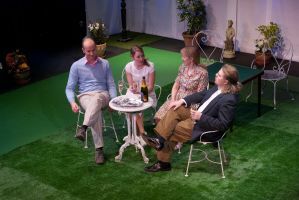 This is a particular problem when the two families are on stage at the same time - for the audience the characters are all equally "corporeal". To overcome this, lighting was used to great effect to bathe the imaginary family in bright light whenever they appeared, or to separate fantasy from reality. What starts as a rather charming escapist fantasy for Susan gradually starts to unravel as the two worlds become confused, and allusions from the real world get taken up and distorted in the fantasy world. As the doting fantasy family, Kassi Chair, Michael Fife and Ed Langley were almost scarily perfect, with their constant affectionate ministrations to Susan and endless glasses of champagne. But as Susan's condition deteriorates they become more anarchic and Ed, as the suave seductive husband, displayed an increasingly menacing edge. By contrast, back in the real world, Susan's actual husband and lumpen sister-in-law, Muriel, were portrayed more as caricatures, particularly the latter (played with great force by Alex Gooch) with her morbid obsession with her dead husband and abysmal cooking. This was perhaps a missed opportunity to show their human side and cast a more objective light on Susan's attitude towards them. But then, I thought, this could be a clever twist to portray them as Susan sees them. Are we seeing everything through the filter of Susan's mind? Hugh Blake-James gave a very solid performance as the dour, pompous vicar-husband who has taken refuge in writing a history of the parish. But towards the end he gave some hints that Susan had perhaps not been the only victim in this doomed relationship. The same applied to the estranged son, Rick, played with a defensive detachment by Dan Murphy. You began to understand why this boy would have wanted to escape his parents' embarrassing behaviour, particularly his mother's over-intimate conversations with potential girlfriends. At this point you began to wonder whether the rift had really been caused by Rick being unreasonable or whether Susan had actually always been a bit peculiar and had driven him away. Has the bang on the head just speeded up what was an inevitable decline? That was the thing about this play, the more you thought about it, the more questions it raised. What if Susan and Bill, the bumbling doctor who has adored her from afar, had got together earlier and escaped their respective failed marriages? Tragically, it is now too late. The scenes between these two were a joy. 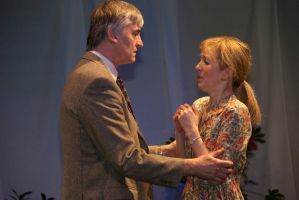 John Hedley gave a wonderfully comic performance as Bill and applied expert timing to Ayckbourn's priceless lines. He was completely credible in the part. Louise Norman as Susan was truly impressive. It was a marathon part, with her character remaining on stage for the whole play and never once did she let her focus drop. She moved convincingly through all the emotions of the character, from confused (with Bill), to serene (with the imaginary family), to waspish and resentful (with her husband and sister-in-law), to hurt and insensitive (with her son), to frightened and despairing when her world starts to disintegrate. 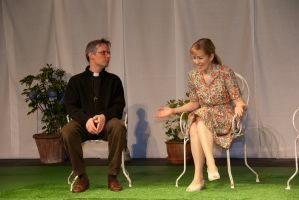 The staging of the play was simple and effective, with white muslin drapes providing an appropriate cloud-like perimeter to the action in the garden. The sound effects of the storm were particularly effective and the way the light sparkled on the artificial grass looked just like glistening rain. 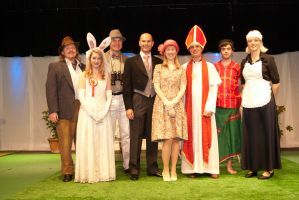 The make-up and costume helped to define the characters, particularly the fantasy family who looked just as someone like Susan would imagine them. I also particularly liked the pens in the doctor's jacket pocket - a small touch like that says a lot about a character. 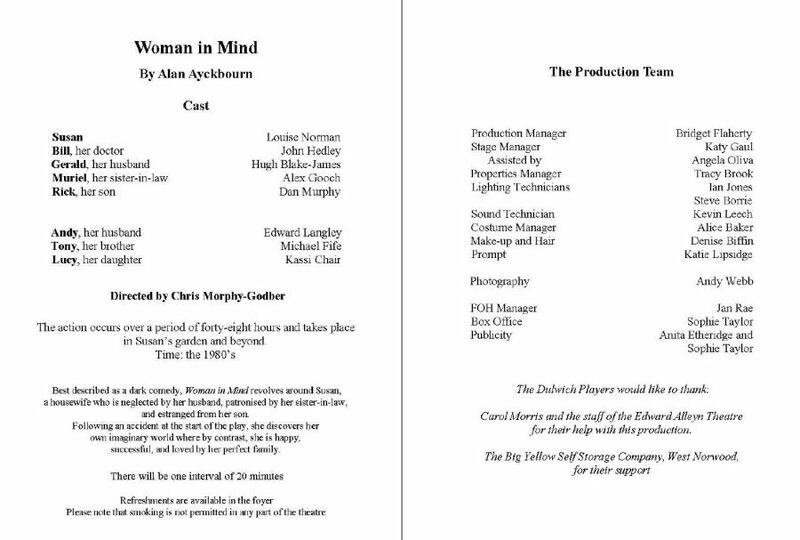 So, all in all, a very accomplished production and thank you to director Chris Morphy-Godber for taking on and realising this unusual and thought-provoking play and giving us all a fine evening's entertainment.